For a moment, think about the town where you grew up. For me, I grew up in a wonderfully small town with equally wonderful people. My school experience was pretty good, but not spectacular as far as I can remember. I never got in any trouble (well, maybe once in an English Lit class one of those high school years). And I left for college appreciative of the entire journey, thankful for the friendships, and grateful for growing up in a small town. But as I left I never forgot the impression that the beauty of the town made on me. In fact, ten years after graduating high school I moved back to my hometown for a meaningful job opportunity, lived there for another five years AND met my beautiful wife. It could not get any better than that. So, I wrote those words you just spent a minute reading to say that I love the town I lived in so many of my years. Since moving away in 2005, we have tried to visit as much as we can. First, to see family. But second, to see the town — with my camera. Enough with the worlds. Allow me to share some photos from a recent trip I was able to make. In fact, this trip provided me the best conditions for taking photos, even though the sun revealed itself for about a five minute time span over the course of five days. No worries. Not every picture can involve a setting sun. 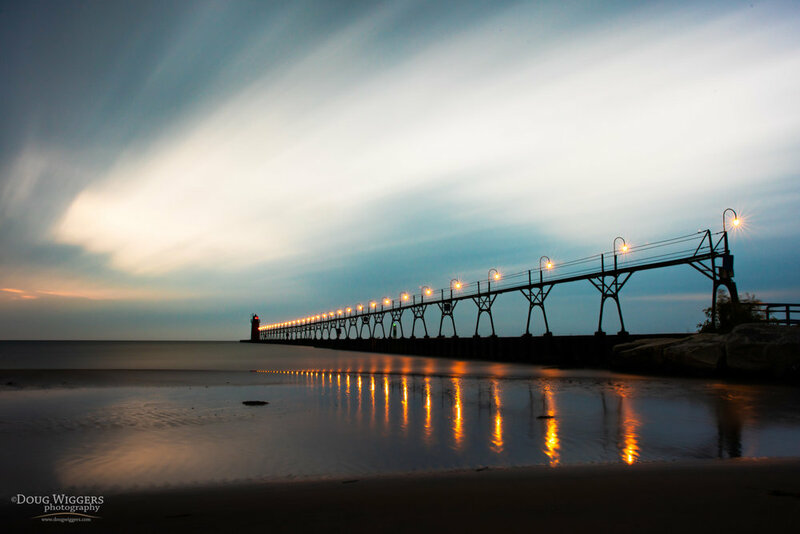 The following images are a snapshot — a photo ‘journal’ if you will of my time in South Haven a couple of months ago. Very much worth it — and I look forward to whenever the next trip home will occur. What keeps me staring at this image is the amount of SAND. In fact, the lower section of stairs is not even visible. It’s buried under the sand from previous winter storms! Way back in the day, I recall the water being up to the bottom of the stairs. Other years the beach would extend out into the lake a long ways. Now a third of the stairs are buried under sand, pushed up during those windy, winter storms. Mother Nature, doing her thing. It is a requirement, by law I think, that a photographer must take a photo of the lighthouse that includes the catwalk lights reflecting on the lake. Check, mission accomplished. Honestly, though, this was a fun attempt at taking a long exposure. The sun had already set and twilight was setting in. This was a five minute exposure. More photos to come. It was a good trip!